I went to the Newburyport Artwalk this past weekend. The area Galleries, Studios & Artisan Shops get together and create a walking map for visitors to follow. The artwork was great, as usual, each place had a different "flavor" to its art. The monthly spotlight artist at the Newburyport Art Association was excellent. She painted lovely sunsets, landscapes and seascapes. We went into one shop and the print-maker artist was there to ask questions of. She walked us through her process of creating prints, it was fascinating. The Walsingham Gallery is a favorite of mine, the quality and variety of the artwork is wonderful. The weather was perfect and after dark as we walked the back streets the leaves shooshed under our feet and it felt like trick or treating - adult style! My favorite snack stop is always the Eat Cake Shop. The cupcakes there are the best that I have had.....and I've had my share. I have been to Boston on a cupcake quest and had cupcakes from a few shops that have been on the TV show "Cupcake Wars." In my opinion Eat Cake is the best by far. Let's just say that I can't go to Newburyport without having a cupcake. Plus you can stand outside and watch them decorate their cake orders - talk about artwork! 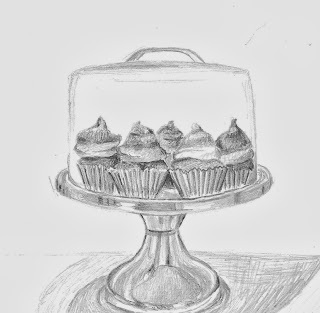 With the taste of sweet frosting fresh on my lips, I did this quick illustration when I got home.